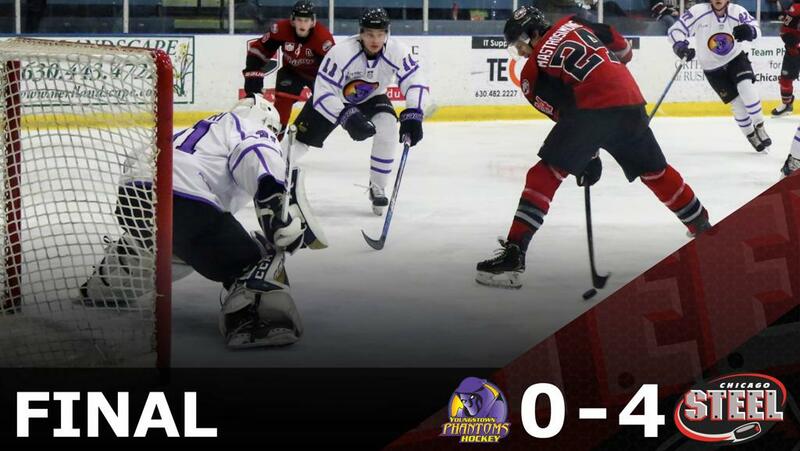 GENEVA, ILLINOIS — The Chicago Steel won their 13th game in a row at Fox Valley Ice Arena with a 4-0 win Saturday night against the Youngstown Phantoms. Steel goaltender Justin Robbins turned aside all 23 shots he faced for his second shutout of the season as the Steel (25-13-1-0, 51 pts.) beat the Phantoms (19-16-1-3, 42 pts.) for the fourth time in five games. The Chicago offense was sparked by Gunnarwolfe Fontaine’s pair of goals and left wing Robert Mastrosimone’s highlight reel, between-the-legs goal that earned #5 on SportsCenter’s Top 10 plays. The Steel cracked the scoreboard twice in 46 seconds just less than eight minutes into the game. Fontaine scored his first goal of the night, and fifth goal in a current seven-game point streak (6-2-8), on an early powerplay opportunity for the Steel. Chicago center Adam Robbins collected a loose puck on the goal line and found Fontaine to the side of the net where the RPI commit toe dragged to the forehand before sniping a wrist shot to the top shelf. The goal was Fontaine’s seventh in five games against the Phantoms this season after recording a hat trick the last time these teams met on January 11. Defenseman Owen Power made it 2-0 on just the third shot of the game for the Steel as he finished off a loose puck in the slot and beat Phantoms goaltender Chad Veltri. Fellow Steel defenseman Luke Reid created the initial chance as he drove to the net but it was Power that took advantage for his third goal of the season against Youngstown. Chicago carried the two-goal lead into the first intermission as Pietroniro made a crease-clearing save with less than a minute to play in the period. Justin Robbins kept the Phantoms off the board early in the second as USHL leading-scorer Brett Murray moved in on a breakaway but Robbins denied the chance. Murray entered the game with five goals in five games against Chicago this season. Mastrosimone made it a 3-0 lead as he deposited his between-the-legs goal to extend his point streak to six games (4-4-8). Mastrosimone was alone in front of Veltri when he received a pass from right wing Josiah Slavin, squared to the net and tucked a forehand shot through the five hole to the gasps of the 1,425 fans in attendance. Fontaine then collected his second powerplay goal of the game halfway through the contest as he threw a pass to the front that bounced off a Youngstown defenseman and past Veltri. The fourth Steel goal, on 10 shots, forced the Phantoms to swap goaltenders in favor of Christian Stoever. Chicago peppered the net with 11 shots in the third period while Robbins turned aside all six shots he faced to maintain the 4-0 shutout. The Steel will hit the road for a pair of games next weekend, beginning with a Friday, Feb. 8 matchup at 7:05 p.m. with the Sioux Falls Stampede. The team then travels to Sioux City for the second matchup of the season with the Musketeers on Saturday, Feb. 9. Chicago returns in front of the home crowd for a Friday, Feb. 15 game at 7:05 p.m. against the Muskegon Lumberjacks for Military Appreciation/Hometown Heroes Night. The Steel then host Team USA U18 for a 7:05 p.m. faceoff on Saturday, Feb. 16 for Let it Snow Globe! Snow Globe Giveaway for the first 500 fans in attendance.